Do the floors in your home show their age? Do they have the telltale signs of foot traffic, pets, and children? Then maybe it’s time for a change. With the installation of new flooring, your entire home gets an upgrade, and each room presents a refreshed face to the world. 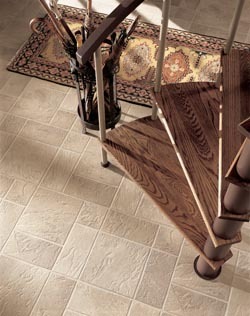 When you choose luxury vinyl tile in Decatur, IL, you won’t be disappointed. It’s a choice which is very popular with Flooring America customers because it’s durable and can mimic the look of high-end flooring, such hardwood and natural, ceramic, and porcelain tile. Our inventory includes all the trusted names in flooring, and our team will be happy to provide essential information and advice so you can find just what you want. What’s not to like about a flooring choice which can installed with confidence in every room in your home? That’s not to say that each room will look the same, but just the opposite in fact. It’s a testament to how versatile and adaptable luxury vinyl tile is and that it’s available in a wide variety of patterns and styles. LVT, as it’s also known, is very durable and low-maintenance, so it’s a good option for your kitchen where traffic is high, and spills are the norm. Your entryway will look great with a new floor that welcome visitors with a dazzling finish that stands up to any grit and grime which gets tracked inside. Another benefit which makes vinyl attractive is that it’s a resilient flooring. It can shrug off the impact of a dropped coffee mug without any damage while also being comfortable underfoot. We’ve all heard the saying that “looks aren’t everything,” and although it applies to people, you could also say it about flooring. Looks are not the only important factor, there are durability, maintenance, and price to consider as well, but appearances are major. Vinyl gives you both durability and aesthetic appeal. With luxury vinyl plank flooring, for instance, you get a floor which is long lasting and looks great, just like traditional wood flooring. Perhaps you’re partial to the earthy appearance of natural stone. This is another instance in which vinyl fits the bill. You can get the color and texture of stone in an embossed surface which is easier to source and easier on your wallet. Save yourself stress and time on luxury vinyl tile installation by choosing our professional team to do it for you. Vinyl can easily be installed over virtually any surface and will look great once we’ve precisely measured, cut, and placed it. Contact us so we can help you with your vinyl flooring choice. We proudly serve customers in Decatur, Forsyth, Mt. Zion, Macon, and Solomon, IL, as well as the surrounding areas.